Following about an hour's worth of fighting in the afternoon of the third of March the Danish brig LOUGEN succeeded in forcing two British frigates to retreat. Lieutenant Commander Carl Wilhelm Jessen, the captain of the brig LOUGEN, later received an honorary sword from the Danish king for the bravery he had shown during the fight, and several of the crew members were also rewarded by the king for their bravery. Less than a month before the British attack on Copenhagen on April 2, 1801 - the battle which was later known as "the battle of Copenhagen Roads" - the war between Denmark and Britain had in fact begun. Due to the increased tension between Denmark and Britain, the British government decided in January, 1801 to place the Danish islands of Danish West Indies under an embargo. In the end of February rumors began on the islands that the British were in the process of assembling a force. The purpose was an occupation of the Danish Islands. In Christianssted on St. Croix the governor, Vilhelm Lindemann, therefore decided on March 3, 1801 to send two of the ships under his command from Christianssted on St. Croix and to the north, to St. Thomas. Their mission was to gather more information. Lieutenant Commander Carl Wilhelm Jessen, captain of the brig LOUGEN, was given the task to clarify what the British were up to. At the same time the governor ordered the schooner DEN AARVAAGNE, commanded by lieutenant Hans Munck, to accompany the LOUGEN. Jessen knew that there were British ships in the waters around the Danish West-Indies. Since he did not know how the British planned to act during a meeting in open waters, he chose to let the schooner DEN AARVAAGNE keep at a distance and take station a distance astern of the LOUGEN. This move had two purposes! 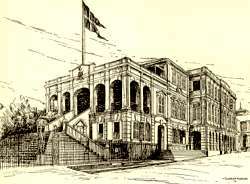 First of all Jessen was of the opinion that it was very important that the governor on St. Croix was informed at once, if hostilities broke out. DEN AARVAAGNE was therefore ordered to return to Christianssted and inform the governor if fighting began. Furthermore Jessen also thought that the small schooner would be in the way during a fight with the British. When Jessen and the brig LOUGEN neared the small uninhabited reef the West Kay near St. Thomas at around three in the afternoon, two British ships were sighted closing in from north-east. as it was sailing due south of the West Kay. The ships turned out to be the British frigate the ARAB, armed with 20 guns, and the privateer EXPERIMENT, carrying 18 guns. The EXPERIMENT was a so-called "lettre of mark". It wasn't the first time the privateer EXPERIMENT was operating in the area around the Danish West-Indies. Less than two years before, on the Second of June 1799, the British privateer had been attacked and defeated by the small Danish brig IRESINE which had been carrying just twelve guns. A heavy fight ensued, and the captain of the IRESINE, lieutenant Peter Carl Lillienskiold later received an honorary sword for his effort and the recognition of his colleagues because of the courage, ability and resolution he had shown during the fight. The ships which met off the West Kay were therefore all ships, which had previously seen battle. At this time Jessen could easily have turned around and reached safe haven in the harbor at Charlotte Amalie at St. Thomas, but since he had been given the task to clarify the British intentions, Jessen instead chose to reduce speed so the British ships could catch up with him. He ordered DEN AARVAGNE to keep at a safe distance. The ARAB, commanded by captain John Perkins, held a steady course towards the LOUGEN, and once it reached within range, it immediately fired off a three shot salvo, aimed directly at the LOUGEN. Jessen tried to contact the ARAB, in order to find out why the British were shooting at him, but he received no answer. He then ordered the LOUGEN to fire a single shot at the ARAB. The British answer was a whole broadside fired at the LOUGEN. The hostilities between Denmark and Britain had now begun, hostilities that within a few weeks would turn into a full scale war. While the LOUGEN immediately fired its eighteen guns at the British, captain Jessen at the same time signaled to lieutenant Hans Munck on the DEN AARVAAGNE, and ordered him to return to Christianssted on St. Croix at once, and notify the governor. Lieutenant Munck on the DEN AARVAAGNE was, however, more anxious to join the fight and assist the LOUGEN. But Jessen gave a direct order to the schooner to return at once to St. Croix. The DEN AARVAAGNE raised its sail and set a course for Christianssted on St. Croix approx. 10 miles away. EXPERIMENT, commanded by captain Koppelmann, tried at first to intercept DEN AARVAGNE, when it tried to sail back towards St. Croix, he soon realized that he had no chance of intercepting the Danish schooner, which was much faster than the British privateer. The DEN AARVAAGNE later reached Christianssted and was able to tell the governor about the fighting, while the EXPERIMENT turned around and joined the ARAB in the fight against the LOUGEN. While the EXPERIMENT had chased the DEN AARVAAGNE the LOUGEN had fought a fierce battle against the ARAB, and both ships had already taken a fair amount of damage. Captain Jessen was trying to draw the British ships toward Charlotte Amalie on St. Thomas. He knew that the powerful guns of the fort would be ready to assist him in the fighting. When the EXPERIMENT came close enough to join the fighting, it brought the LOUGEN into a position, where it was fired upon from both sides. But Charlotte Amalie was now almost within reach, and Jessen and his crew continued the uneven, but courageous battle. The brig LOUGEN answers the British crossfire. The brig did not have enough crewmembers to man both the sails and the guns in both sides of the ships, but the LOUGEN's second in command, lieutenant Hans Stephansen, quickly suggested that the Danes only used a few of the guns in the port side against the new enemy. The crew was hastily assembled and received a quick course in the manning of the guns, and commanded by lieutenant Johan Christian Tordenskjold four of the guns in the port side were now manned by some of the topmast men and foretop men and they quickly started firing at the new enemy ship. The sails were essential for the brig, for without them the Danes would not be able to steer the ship, and thereby avoid the British coming close enough to attempt to board the Danish brig. The British frigate the ARAB had more than twice the number of men aboard and a British boarding was therefore likely to end in a takeover of the Danish brig. At he same time the shot-damaged rigging had to be repaired the whole time, and the guns could not spare the men. Chief officer Peter Hee, second officer Niels Espen and carpenter Kilbert Svendsen were all working hard at the guns, and at the same time working hard at repairing the shot-through ropes. On several occasions the ropes the men were hanging from were shot down, causing the men to fall to the deck below. Chief officer Peter Hee fell down three times and received several smaller injuries, before he was able to complete the reparation of the sails and rigging. The battle could easily have turned into a catastrophe for the Danish brig. The untrained gun crews on the LOUGEN were working very fast and due to their lack of training, they spilled a lot of gunpowder on the deck of the ship. Even though the deck was wet, a single spark ignited some of the gunpowder, but the crew moved very fast and was able to quell the flames before disaster struck. When the master gunner Erik Hendrichsen Hoff, discovered the fire, he first ordered his gun fired and he then proceeded together with gunner Lars Olsen and gunners mate Niels Pedersen along with the rest of the gun crew, who gathered around the fire and stamped on the flames until they were all gone, and they thereby saved the ship. This happened without any of the guns ceasing fire. was the first to leave the battle. The battle had now raged for more than an hour, and the LOUGEN was now nearing St. Thomas, from where Jessen hoped to be assisted by the guns at the fort. A lucky shot from the LOUGEN hit the bosse that secured the anchor on the ARAB. The bosse was keeping the port anchor in place, and the shot resulted in the anchor falling into the water - still attached to the ARAB. The anchor did not reach the bottom, but it reduced the ARAB's ability to steer. The crew was unable to cut the anchor chain and thereby release the anchor. Simultaneously the battery at St. Thomas joined in the fighting, and the damaged British frigate now chose to leave the battle and withdraw to Tortola, where it could repair the damage. The EXPERIMENT was now left on it own to face the guns on the LOUGEN and from St. Thomas. Jessen was now able to use all his guns against the weaker armed British ship, and following a few well-aimed shots from the LOUGEN, the EXPERIMENT rapidly chose to retire from the fighting. The battle of the West Kay had therefore been ended in about an hour, and the brig LOUGEN was now able to sail into the harbor at Charlotte Amalie's on St. Thomas, and here receive the cheers from the people of the island. The Danish brig had one casualty; seaman Christen Sørensen and three wounded, including lieutenant F. M. Dodt. The LOUGEN had also received several hits on its hull, sails and rigging. The British had suffered more and left the battle with eight dead and ten wounded, and both British ships had taken several shots near the waterline. The British commander, captain John Perkins, later tried to diminish the episode. In his log, he just noted that he had had to abandon the fight when the guns at the fort had joined in the battle. He also only wrote of the minor damage to his sails and rigging and noted that one of his guns had been destroyed. A few weeks later, the then 37-year-old captain, Lieutenant Commander C. W. Jessen, along with his crew, ended in British captivity, but when he returned to Denmark in the summer of 1801, the Danish Crown prince Frederik presented him with His Danish Majesty's honorary sword in gold. The sword bore the inscription: "For courage shown on the third of March 1801". He furthermore received 400 rix-dollars - a whole year's salary. As captain of the LOUGEN, Jessen had already made people notice him when he in 1800 had taken the British privateer EAGLE. This had also happened near the Danish West Indies. As captain of the ship-of-the-line PRINDS CHRISTIAN FREDERIK Jessen in 1808 fought another courageous action against the British. This time it was against a far superior force consisting of two ships-of-the-line and three frigates and the battle took place near Sjællands Odde at Zealand. 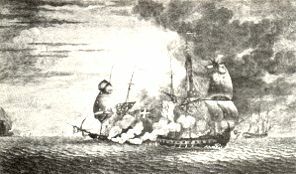 The battle resulted in the total destruction of Jessen's ship and among the many dead Danes were one of the heroes from the battle of Copenhagen Roads - young lieutenant Peter Willemoes. But not only the captain received a reward from the king. Six crew members from the LOUGEN were also subsequently awarded the silver Order of Merit, as a token of their courageous effort during the battle of the West Kay. On April 29, 1801, the Admiralty informed that chief officer Peder Nielsen Hee, second officer Niels Espersen Tømmer, gunner Lars Olsen, gunners mate Niels Pedersen, enlisted seaman Kilbert Svendsen and able seaman Erich Hendrichsen Hoff had all received a silver Order of Merit and 15 rix-dollars a year in pension. Lieutenant F. M. Dodt, who had been wounded during the fight, was also a talented illustrator. When he returned to Denmark, he was given six months leave, so he could finish his drawings from the battle. Despite the heroic fight on the third of March 1801, the fight was to turn out to have been fought in vain. On March 28 a British naval task force consisting of three ships-of-the-line, six frigates and twenty armed ships and transports landed at St. Thomas. The force, which was commanded by Admiral Duckworth, included four thousand troops, commanded by General Trigge. The Danish forces, commanded by C. W. Scholten, surrendered without a fight to the superior British force, and the brig LOUGEN fell into British hands. Three days later the governor Lindemann at St. Croix also had to surrender. The British hereby took control of the DEN AARVAAGNE and the brig IRESINE, commanded by lieutenant Christian Flensborg. At the end of May the British also took control of the Danish possessions at Tranquebar and the other Danish colonies in East India. The islands were returned to Denmark after the peace-agreement was signed at Amiens on the 27th of March 1802. 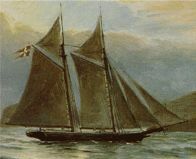 The schooner stayed at St. Thomas, while LOUGEN returned to Denmark. Danmarks Søkrigshistorie, by Kay Jungersen, udarbejdet til brug ved undervisningen på Søværnets skoler, published by Søofficersskolens foranstaltning, Centraltrykkeriet, Copenhagen, 1945. Den Danske og Norske Sømagt, by J. C. Tuxen, P. G. Philipsens forlag, Copenhagen, 1875. Efterretning om det bekendte af den danske Flaades Tjeneste, efter Alphabetisk Orden, med adskillige Bilage, fra Aar 1752 og til den Dag, da Engelland voldsom bortførte samme i 1807, by Rear Admiral P. Ramshart, published by Hof- og Universitetsbogtrykker E. U. H. Møller, Copenhagen, 1808. Flåden og Dansk Vestindien, by Per Nielsen, published by Forlaget Marinehistoriske Skrifter and Dansk Vestindisk Selskab, 1997, (ISBN 87-87720-14-0). Fædrenelandsk Nekrolog eller efterretninger om de ved stilling og virksomhed og ellers bekjendte afdøde i de fem år 1821-1826, by etatsraad Frederik Thaarup, Copenhagen, 1835-1844. Lougen Orlogsman og Koffardimann, by Rolf Schou, Norsk Sjøfartsmuseum, Oslo, 1933. Officerer i den Dansk-Norske Søetat 1660-1814 og den Danske Søetat 1814-1932, Bind I og II, by Th. A. Topsøe-Jensen and Emil Marquard, H. Hagerups Forlag, Copenhagen, 1935. Vor Sømagts Historie, by O. Eidem and O. Lütken, Det Nordiske forlag, Copenhagen, 1905.
or do you hold a great story? please e-mail me, enclosures are welcome. Please remember to list your sources. You can also use the Naval Web Forum on this web-site.